Some statues are dressed - and the dress changes for the 3 seasons. Buddha, I learned, is not a person, rather, a principle: clarity, luminosity, and openness three of its pillars. The ability to be completely present in each moment – that is Buddha. When one is able to be Buddha in each and every moment, that is Enlightenment. 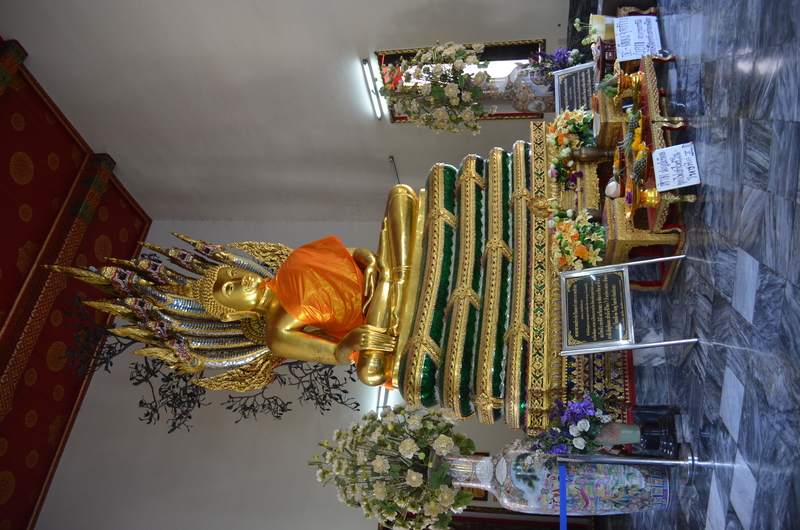 When one is traveling in Thailand, it would be a mistake to think that the thousands of Buddhas everywhere are in honor of a person. Although some are. It’s very confusing. But this explains why there are hundreds of variations on the idol. 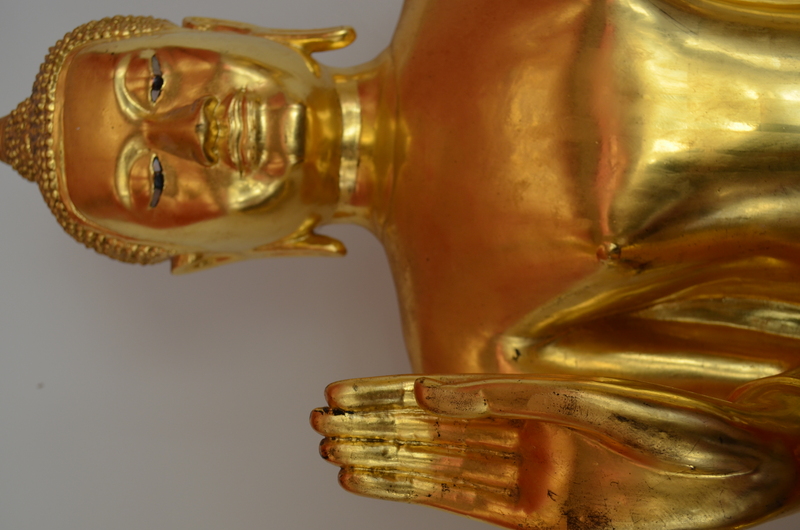 Did you know, for example, there is a different Buddha, with a different pose, for every day of the week? Buddhists celebrate the one that is for the day they were born. 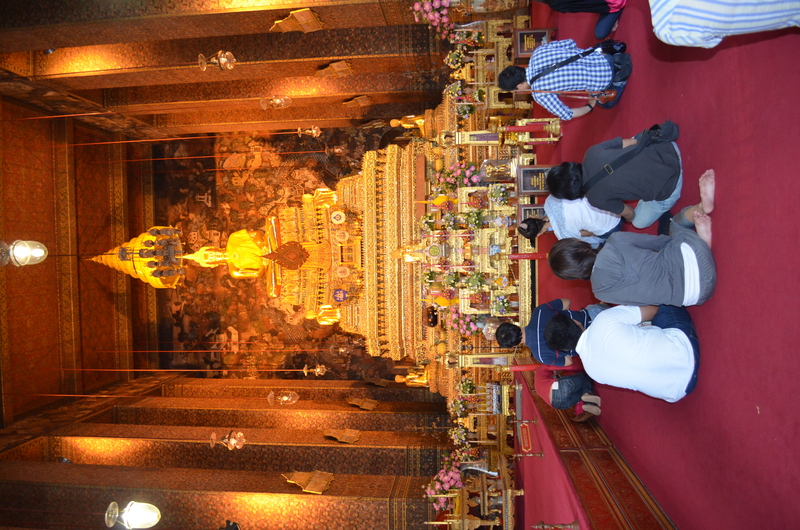 Birth days are highly celebrated in the Buddhist religion. Every Buddhist (according to our guide) knows the day of the week on which they were born, the color that coincides with that day and the animal that complements the year they came into the world, similar to the Chinese zodiac. 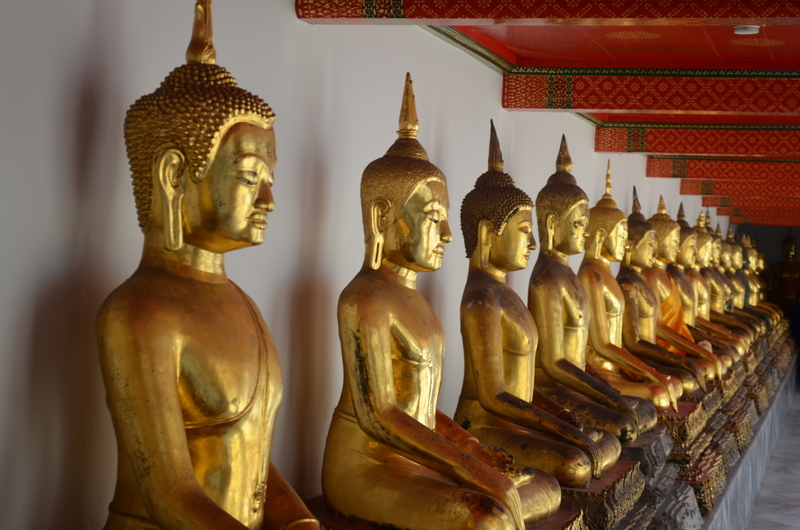 So many Buddhas, so little time. Talk to the Hand, tiny human. 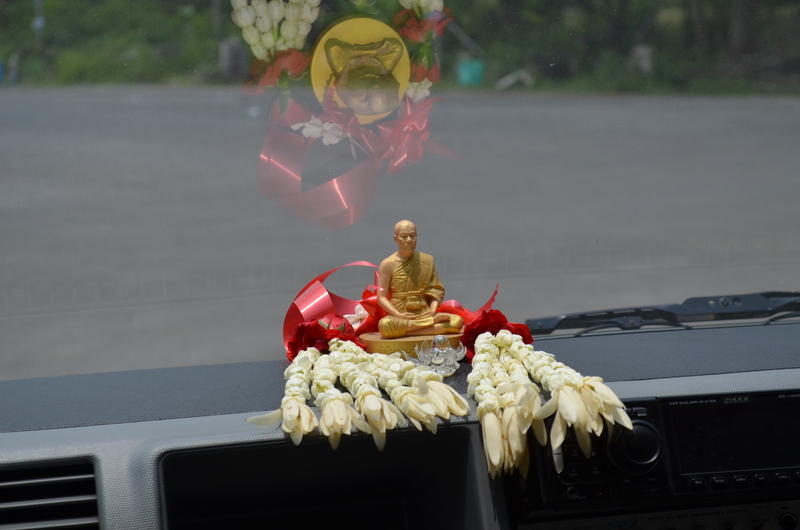 Dashboard Buddha! Best seat in Thailand. 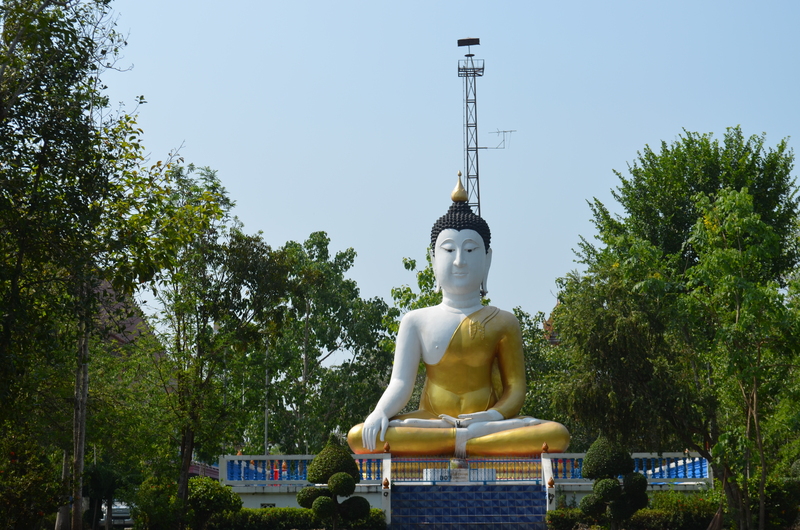 Enormous meditating Buddha- Down by the River. 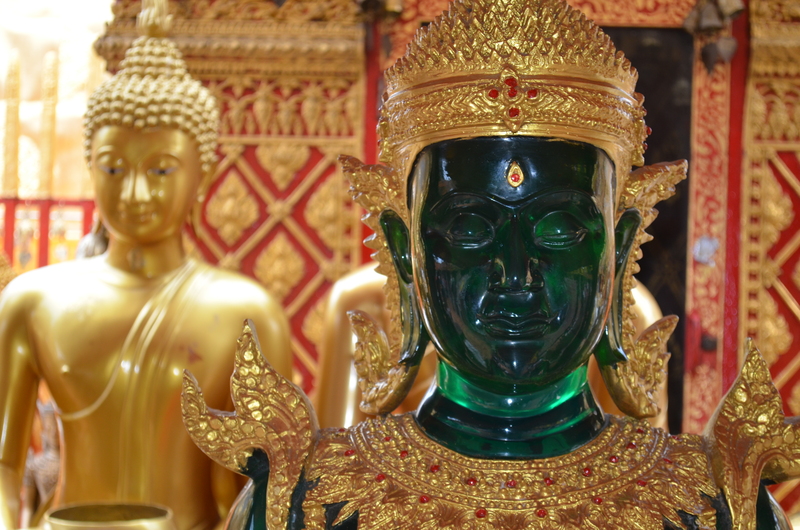 Emerald Buddha, but not THE Emerald Buddha. Dashboard Buddha. Down by the river. Tiny human. I love reading here. Keep it; you’ll be so glad you did later when you can’t remember the details! Hugs to Hamlin5 from Young5! Thanks Vicki! This is so interesting. Tell Natalie that Phoebe is also a blue rooster and Caleb is a purple snake. I will! She’ll love it. Hey, Natalie’s birthday is July 20th. Will you guys be around to come celebrate up in the ‘hood?